Daughter of an Albanian businessman who died when Agnes was nine years old. Nun, missionary and teacher in Calcutta, India in 1928. In 1948 she left the convent to work alone with the poor, and became an Indian citizen. She founded the Congregation of the Missionaries of Charity in 1950. 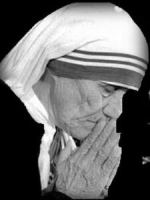 In 1957 the Missionaries of Charity started their work with lepers and in disaster areas. She received the Pope John XXIII Peace Prize in 1971, the Jawaharlal Nehru Award for International Understanding in 1972, and the Nobel Peace Prize in 1979, and the Missionaries today work in 30 countries. Educated at the Abbey of Luxeuil, France known for its strict adherence to the Rule of Saint Columban, a Rule known for its austerity. Though he was not a novice, Bertin felt called to follow the Rule with the monks at the abbey; when grown, he took the cowl. 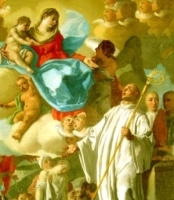 In 639, Bertin and two other monks, Mommelinus and Ebertram, joined Saint Omer in evangelizing the people in Pas-de-Calais, a region renowned for idolatry and immorality. The evangelists had no great success, but they built a monastery in honor of Saint Mommolin. Bertin served as its first abbot, a calling that lasted the remaining 60 years of his life. He sent monks to found other monasteries in both France and England, and he travelled constantly to teach and evangelize. His monastery served as an example to the locals, and brought many to the faith; 22 of its monks have been canonized. During a life that spanned nearly a century, Bertin was known for holiness and severe self-imposed austerities. On his death, the monastery was re-dedicated to him. Born to a regionally important family. Hermit in Butrio (modern Palazzuolo) near the Borrione River Valley in the diocese of Tortona, Italy in 1030. When he miraculously mute son of the Marquis of Casaco, the Marquis built a Romanesque church where Albert and his brother hermits could assemble for the Divine Office. Albert became a Benedictine monk, and the church served as the core of the Benedictine Cluniac monastery he formed at Butrio; he served the rest of his life as as its first abbot. Priest in the diocese of Castres, France. Imprisoned for his faith on a prison ship during the persecutions of the French Revolution, he ministered to other prisoners and cared for the sick until his own health broke. Martyr. Lifelong layman in the apostolic vicariate of East Tonkin. Physician. Catechist and Dominican tertiary. 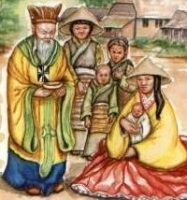 One of the Martyrs of Vietnam. Layman servant in the house of nobleman Thomas Darcy. Known for his love of the Faith and the Church, he refused to acknowledge the king as head of Christianity in England, refused to attend Protestant services, and continued to encourage people to join and support Catholicism. For this he was imprisoned, tortured, prosecuted to treason, and executed. Martyr. Premonstratensian monk. Canon of the Premonstratensian monastery in Dokkum, Friesland (in the modern Netherlands. Chosen 4th abbot of the house. Friend of and correspondent with King Louis IX of France. Championed and preached support and participation in the Crusades in Friesland. Died while attending the Premonstratensian general chapter. Born to the Italian nobility. Franciscan Friar Minor. Missionary to the Muslims in Egypt, Persia and Armenia. Martyr. Raised in a pious Christian family. Bishop of Soissons (in modern France) in the mid-7th century. Attended the Council of Rheims. Built the church that houses the relics of Saint Crispin and Saint Crispian. 12th century monk. Spiritual student of Blessed John of Matera, and of Blessed Jordan of Pulsano. Founded the monastery of San Michele on the island of Mont Gargano at Mljet dálmata, Dalmatia (in modern Croatia), and served as its first abbot. Benedictine monk at Pulsano, Italy. Spiritual student of Saint John of Pulsano. Abbot-general of Pulsano from 1139 to 1152. Member of the imperial Roman court of Emperor Trajan. 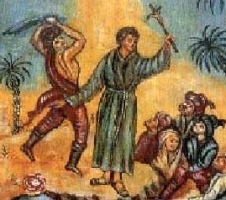 During a period of persecution of Christians, Romulus spoke out against the abuse; he was immediately arrested and executed. Martyr. Related to Saint Rudesind. Benedictine monk at Sahagun, Spain. Bishop of León, Spain in 1057. Transferred the relics of Saint Isidore from Seville, Spain to León. Relative of Saint Remigius of Rheims. Bishop of Laon, France. For some unnamed fault he committed, he sentenced himself to seven years of continuous penance. Sixth-century bishop of Amiterme, Italy (outskirts of Rome). Martyr. Monk. Abbot of the monastery of Anchin. Bishop of Como, Italy. Fought Arianism. Nun. Her story has been lost. Martyred in the persecutions of Trajan. A group of up to 1,000 Christian soldiers in the 2nd century imperial Roman army of Trajan, stationed in Gaul. Ordered to sacrifice to pagan gods, they refused and were transferred to Armenia. Ordered again to sacrifice to pagan gods, they refused again. Martyrs. We know the names of three of them, but nothing else - Eudoxius, Macarius and Zeno. Three Christians who were martyred together. Long venerated in Capua, Italy. We know their names, but little else - Arcontius, Donatus and Quintius. A group of 80 Christians, lay and clergy, martyred together in the persecutions of Valens. We know little more than the names of three of them - Menedemo, Teodoro and Urbano. A group of Christians martyred together in the persecutions of Marcus Aurelius. We know little more than their names - Aconto, Herculanus, Nonno and Taurino.